I almost forgot to write about this burger, which is really nuts, because it is quite unforgettable. 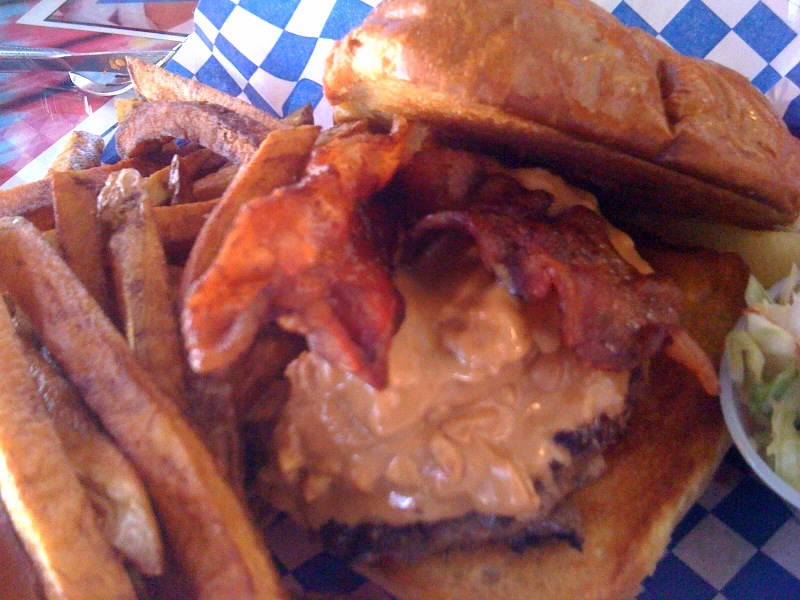 I've seen and heard a lot about putting peanut butter on a burger, but this was my first go-round. The fact that it was at this super friendly hippy-themed cafe in southwest Vegas made sense somehow. If I'd been high, would it have been better? Doubtful. It's pretty damn good in a sober state. There really are only three ingredients: a half-pound of very well prepared beef, giant strips of crispy bacon and a liberal amount of chunky peanut butter on a nice buttery bun. The PB pretty much melts away instantly, leaving you with a sweet-and-creamy infused beefy bite augmented by the crunch of chopped peanuts. This is one of the few burgers where bacon is something of an afterthought. I want to make a joke now about a "flavor explosion" and this place being called Rambo's, but, nah.